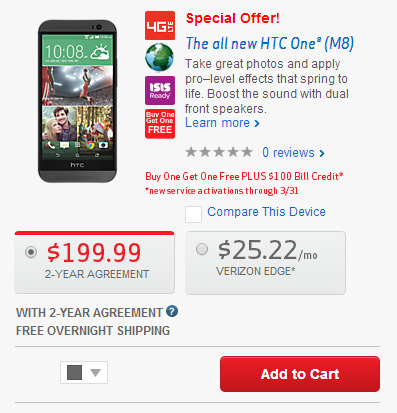 Verizon is really getting into the new HTC One M8 the carrier will give you two m8 for the price of one! Verizon has a pseudo-exclusivity on the new flagship as it's the only carrier that has it in its stores. 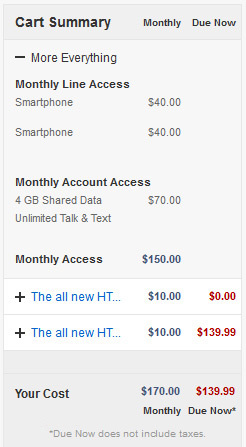 Anyway, the deal is you pay $200 and get two HTC One M8's. That, of course, means you'll have to sign two contracts, so it's really just $200 off. A separate promotion will give you $100 bill credit when activating a new service, Same offer applies to some other Verizon phones too.